Do you think Wonder Woman ever has a "don't day"? You know, a day where she just rents a couple of movies, makes a big bowl of popcorn, throws on her favorite blanket, and then does absolutely nothing for the rest of the day. If anyone deserves one, she does! After all, she spends so much time fighting bad guys, saving the world, and being a symbol of compassion and justice. Well, you deserve a "don't day" too! You might not be fighting against superpowered villains like Ares and you might not have any superpowers, but you do get out into the world and administer your own unique brand of heroism. That's why we think it's time for you to treat yourself to this cozy Wonder Woman comfy throw for a "don't day" of your own! This Wonder Woman comfy throw is officially licensed from DC comics and is perfect for feeling like a hero during your day off! Put quite simply, it's a blanket that you can wear. It's made out of an ultra-soft fleece material and has a pair of sleeves to make it fit like a robe. The front as a comic book style image of Wonder Woman designed onto the front, with great details, like her wrist guards and her red, white, and blue body suit. If you're trying to find a cozy way to feel like a superhero, then this cozy throw is an easy choice. 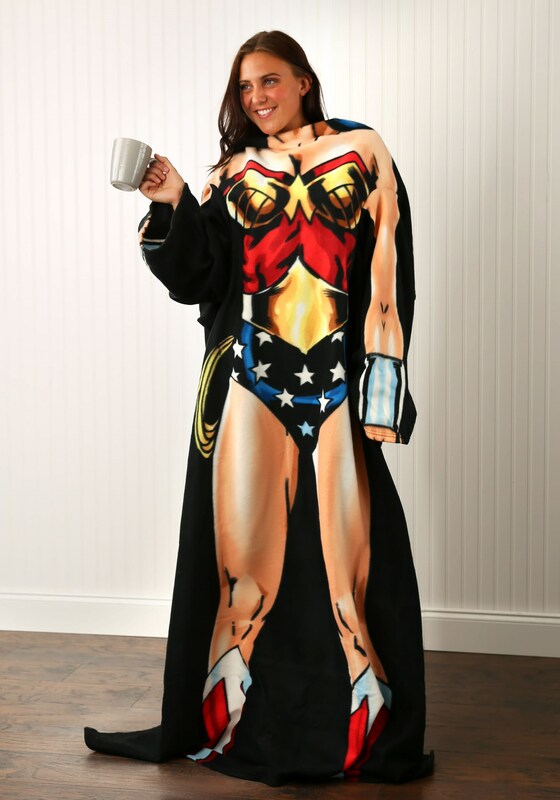 If you're looking for a funny, yet relaxed way to cosplay as your favorite DC superhero, then this comfy throw is also an easy choice. And, of course, if you're Diana Prince and you're just looking for something to wear during your "don't day," then you can count on this wearable blanket!